Columbia International University’s annual Shofar Cup week of competition included energy-packed events as students showcased their talents, built house spirit and competed for “points” in an adventure race, a cook-off, a trivia bowl, a coffee house art display and a video game tournament. The Shofar Cup is a part of The House Collective that includes year-round social events, service projects, small groups and house competitions where house members compete to win points to earn the title of House Victors. Every student is assigned to one of six houses: Fidelitas, Dignitas and Veritas for the women; Virtus, Justitia, and Sapientia for the men. Each house has its unique identity, traditions, colors and crest. "I thought the week of the Shofar Cup was a time of fellowship within the houses and an (opportunity) to give the best that they all could do for the week of competition events," said freshmen Tyler Marshall. Encouraging cheers for each house echoed through campus as racers dashed from the starting point at The Quad through the wooded campus trails, over the CIU Lake on paddleboards, and back to The Quad. 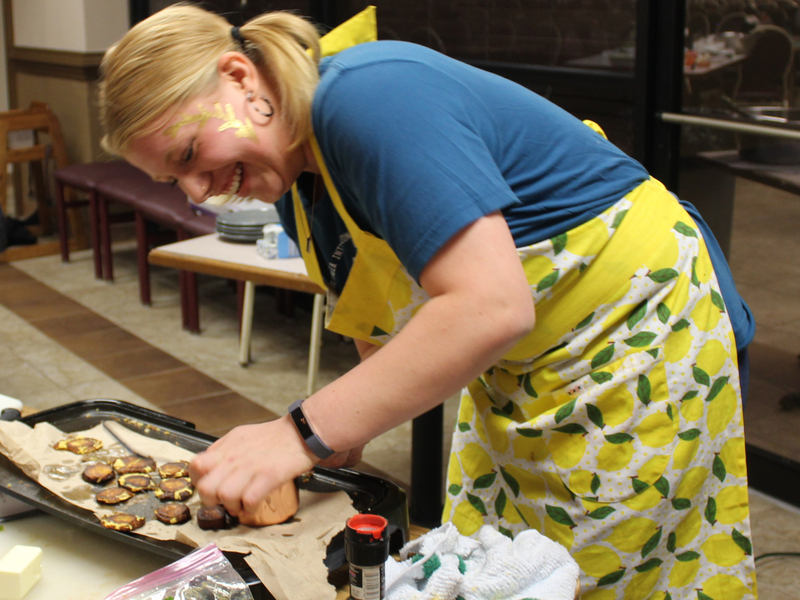 The cook-off on Tuesday transformed the cafeteria to CIU’s own Top Chef or MasterChef where a duo of cooks from each house prepared an appetizer, an entree and dessert. Everyone held their breath as the judges tasted the dishes and awarded points. The event on Wednesday evening was a trivia bowl. Questions were asked, timers buzzed and answers flew. Houses earned points by submitting photography, artwork, reciting original poetry, submitting academic papers and topical papers, the recitation of original poetry and dramatic readings. Prospective CIU students who were on campus for Preview Days visited the coffee house. Friday featured a Super Smash Bros. tournament in Hoke Auditorium with several TV monitors lighting up the action. Sophomore Jevon Hilton said he was glad to see a number of the CIU women play a video game that often only brings out the guys. “The Shofar Cup really brings people together,” Hilton said. Wrapping up the week on Saturday, was CIU’s annual talent show “Acousta.” After selected in auditions, students took to the Shortess Chapel stage to present hilarious comedy acts, outstanding band performances and moving solo performances. The women of Fedelitas or “Faithfulness,” erupted into cheers, ecstatic at their win. Bailey Warren, a junior, who is a campus life coordinator for Fidelitas, said the women of her house worked hard to earn the Shofar Cup. Columbia International University ranks #1 among colleges and universities in South Carolina by BestColleges.com. Excitement is growing on campus with the new $20 million William H. Jones Global Business & IT Center and CIU’s first baseball program. Request information on enrollment at CIU and Columbia Biblical Seminary or call (800) 777-2227, ext. 5024.